Donald Takayama's MODEL-T classic noserider. Opaque champagne tint in a gloss and polish finish. Black Takayama logos. Volan forward swept 3/4 deck and diamond fin patch. Single stringer of 5/16" redwood. Squaretail with a big concave nose. Single finbox, Takayama center fin included. 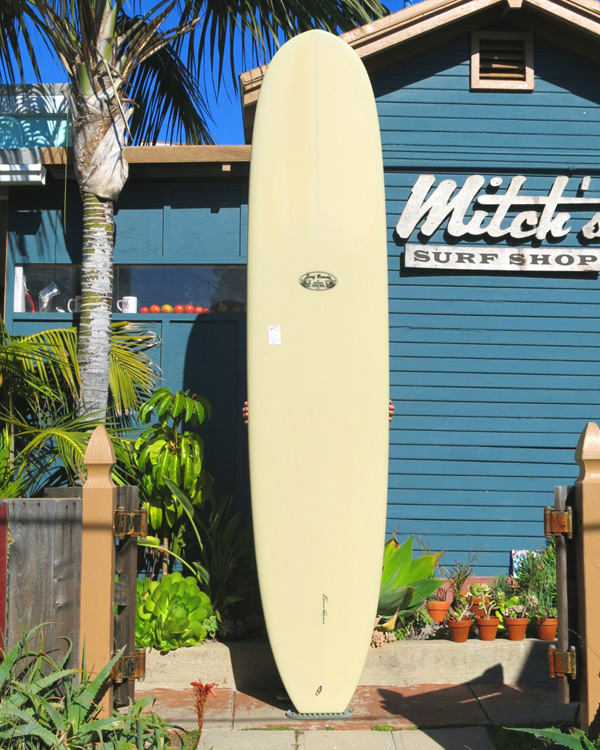 Length: 9' 1" Width: 23" Thick: 3"
Nose: 19 3/8" Tail: 16 1/2"
One of Donald's retro classic longboard designs; versatile with a broad, easy to ride nose, wide loose tail - perfect for low to shoulder high waves. Soft 60/40 rails, single fin, squaretail with a drawn-out concave. Made by Hawaiian Pro Designs in Oceanside, California.